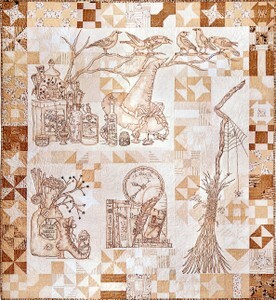 Love going to guild's quilt shows. Auburn's is always a joy to go to. The talent in this guild is tremendous. Plus so many of my friends from different places I have lived in this area go to this show that it is great fun. I love to take pictures of the quilts on display. I take only a few. I would take more but there are so many people there that sometimes it is hard to get a clear picture without taking someone else in it. I must say though that I was disappointed that I did not win a raffle basket. They have some great ones to choose from. Oh well. My $10 went to a good cause anyway. I have made all these blocks and am in process of putting the sashing around each one (6 done so far). I am so excited I am so far on this quilt. I just love it. Since I have so many projects that HAVE to be finished, I may not get this one done for a while. But it is on my design way calling me to constantly. I will post a picture when I finish mine. I especially loved this one because I thought it was a great way to portray travel pictures. Gil and I are planning traveling around the US and Canada starting next spring. I will keep this design in mind when we are out and about. This is just one of several that were on the stage. They were all the same pattern, but they were all done with different fabrics. It must have been a guild challenge or maybe a group. They were all gorgeous. My daughter loved this one the best, so it is the one I took a picture of. You can seen the one behind it used more subdued colors. Just as beautiful. I love this pattern. I have it for sale on the website. 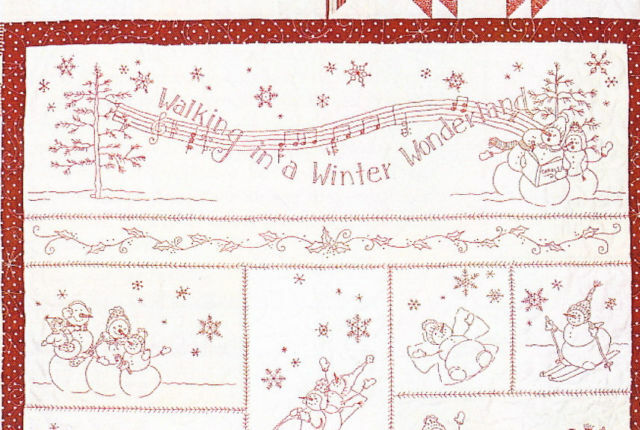 There is a lot of embroidery but little piecing. I need to start this if I want to have it done in time for the holidays this year. I am realistically looking at 2013 instead, I think. Too many projects. I had to take this one. My son had an Iguana that was over 6 feet long named Nando. He would love to have this quilt. 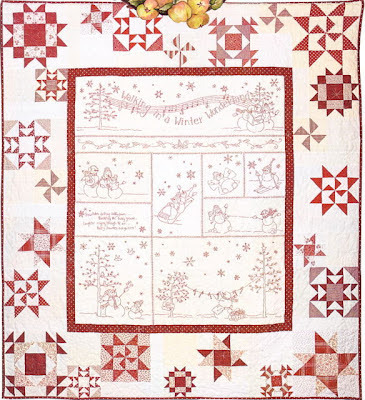 It is an original design by the quilter. I collect lighthouses, so I tend to gravitate to anything seaside or lighthouse related. Love this one. It was a very peaceful setting. 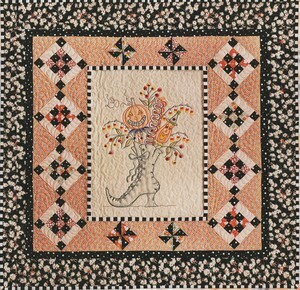 Beautiful embroidered Halloween quilt. We carry this on our website. 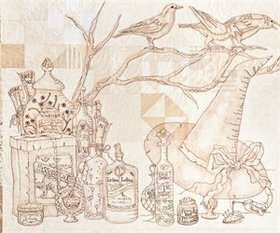 It will be a someday to do quilt. 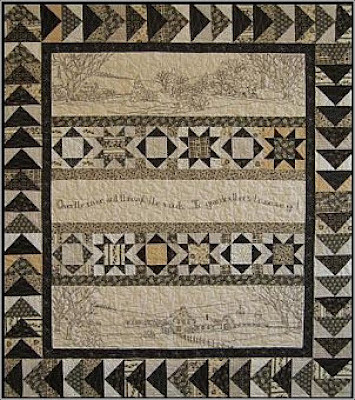 This is an upclose of part of the quilt above. This was done with colored thread on black material. I just loved this. Plus it is Halloween, which is always my favorite. Hey, anything with a bee or a hive I will be drawn to. Don't you love it? 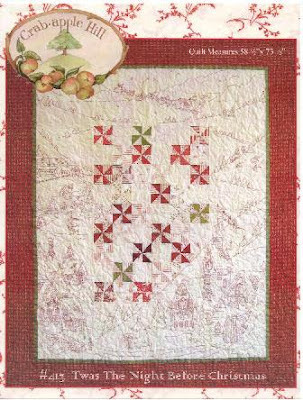 This is the first quilt I have seen using the large template. I had just bought one at a vendor booth and was excited to see one done up. Bunnies are a great draw. Plus I have a lot of veggie and fruit fat quarters that I need to use someway. This would be a great design to use some in. Another iguana. 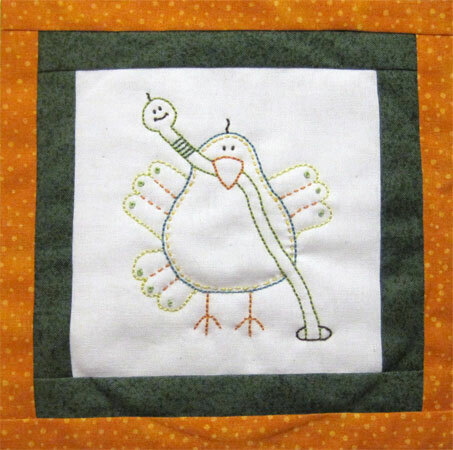 Great quilt if you love lizards, which I do. 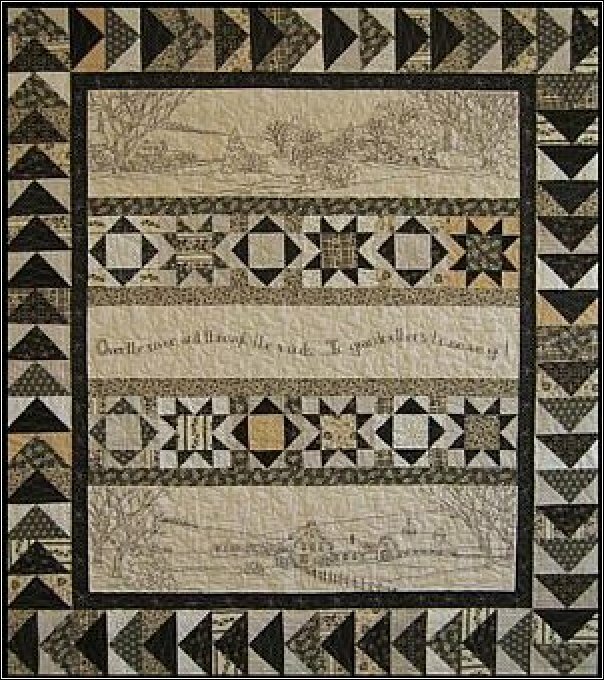 I hope you have enjoyed seeing these quilts. All are thought provoking and makes me want to get busy on some of my "want to do" list. Of course that is after I finish my UFOs and special projects that I have running. I found a great blog that is currently running a free BOM of simple dog applique. They are really cute. Depending upon the fabric chosen to make the dogs, this BOM will be really adorable and one that could easily be done and finished. Doesn't that make you want to take part in this BOM? No cost. FREE. Fun. Easy to do. Check it out. You can download the instructions in English off her website. The link is on her blog. They are really fun and would be fun to do. Great gift idea for someone special, too. I have done mitered corners often. They always come out, BUT. . . .Sometimes it takes me more time to get it right than I think it is worth. So often I just opt not to do them. Here is a video that shows how to make them. It is a little slow going at first, but it was worth my while to stay with it and view the whole thing. I have not tried this technique yet, but I shall soon. In fact I have a quilt top done to the point that I was ready to put on the final border, which I was going to miter. I have had it to this point for several months and have been putting it off. I will let you know how they come out. If you try this, let us know how it came out for you. I am so excited. I have never taken part in a block exchange. I belong to QuiltingBoard.com, which is free to everyone. You do not even have to enroll, but if you do not enroll you cannot post. But it is free, so why not? These are the six pumpkin ones. I had to use two different fabrics, as I only had orange fat quarters. 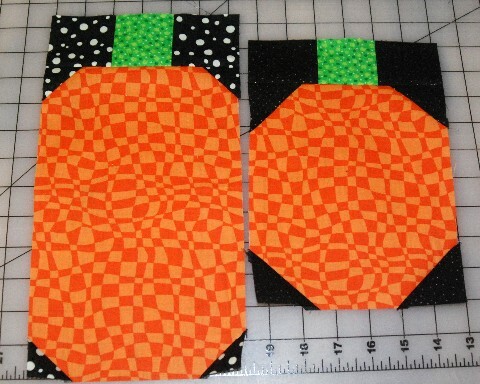 Anyone someone posted they were organizing a Halloween block exchange. Well for those of you who read my blog regularly know that I am really fond of Halloween. 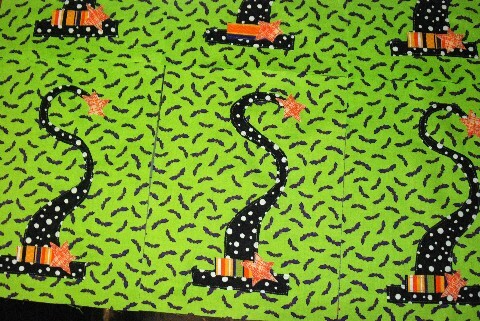 I probably have more Halloween fabric than any other theme. Anyway I responded I wanted to be part of it. These are the witches hats. This picture really does not do them justice. They are really cute. So the rules are to make six blocks to exchange. They can be all the same or all different. I made two sets. Each set is the same but different from the other set. See in the pictures what I did. Dimensions have to be divisible by three. So my pumpkins will be 12" finished by 6" finished. The witches hats are 12" x 9". I think they turned out cute. This shows you how much shorter mine is than the ones I am sending. It will not make any difference in the long run. I just like the longer ones since they are here for me to see. We were told if we wanted our own blocks in our finished quilt, we needed to make one and not send it. So I made one of each for myself, too. My pumpkin block is not as big as theirs. I ran out of the orange fabric, so mine is shorter. Just as cute, though. This is a closer picture, so you can get an idea how cute they are. The background fabric has bats flying around. Here it looks more like jelly beans.